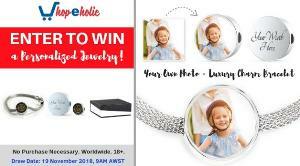 Prize: "Enter to Win a Personalized Jewelry valued at A$103.97! This Jewelry Item Is the Perfect Keepsake! Whether for Yourself or a Loved One. What you must do to enter: Log in via Email to automatically enter the Shopeholic Giveaway. More chances of winning when you refer your friend/s, or when you engage to social media. Statistics: This contest was opened by 109 and entered by 7 ContestChest.com members. 6% of those who opened the contest, entered it.